The 2019 College Football Playoff Championship is rapidly approaching, and the championship matchup has been set, as the Alabama Crimson Tide will play the Clemson Tigers for the fourth straight year and in the final game for the third time in those four years. This year’s game will be held at Levi’s Stadium, (home of the San Francisco 49ers) that will surely be a packed house full of rabid college football fans. For any specific seating-related questions, check out our detailed CFP Championship seating chart blog here! Fans can expect tickets for this year’s College Football Playoff Championship to be in huge demand due to the massive popularity of the sport itself and fanbases of the teams in the playoffs who are known to travel well and willing to spend up to catch their team’s pursuit of a national championship in person. Whichever two of these four teams remaining that make the final game will represent two fan bases for which their will be huge demand and high prices for tickets to catch the games in person, which prompts the question: how can you get the cheapest College Football Playoff National Championship Game tickets? While these tickets are in extremely high demand each and every year regardless of how big or small the participating schools are, there are a few ways that interested buyers can try to obtain tickets at or around face value before they hit the secondary market and ticket prices soar. The following ways are the best opportunities that we’ve found for fans interested in securing tickets early on. Ticket Reservations – One way fans can try to acquire tickets around face value is through the College Football Playoff’s official website that has instilled an RSVP platform that allows fans to purchase a “reservation” for tickets to the CFP National Championship Game for the team of their choice. The cost of a reservation is dependent on market value, so a team like Alabama for example – who finish near the top of the rankings each and every year and have been the only five-time participant in the College Football Playoffs since they were instituted in 2014 – would command the highest reservation price because fans are extremely confident that they’ll be there in the end – and with good reason. If a fan pays for a reservation and their team makes the playoffs, they have the right to buy a face value ticket to the game, which in the end amounts to a great deal of savings that initially came with some risk. If you fear your team will NOT make the big game, you have the right to sell your reservation spot at whatever price you see fit at any time, but keep in mind that if you’re looking to get rid of it for factors like your team’s chances having taken a big hit, others may not be willing to pay as much. If your team doesn’t make the final game, you’re out the money that you paid for the reservation either way. Playoff Premium – While the mere connotation of the term “premium” suggests otherwise, purchasing tickets through the premium package offered by the CFP official website can still be an ultimately economical route. As the final CFP rankings that will be announced on December 2nd draw closer, fans of those teams will start to pull the trigger and pay the price for these premium packages that include a ticket to the National Championship Game and amenities like pregame and in-game hospitality packages, souvenirs, and postgame photo ops, among others. Participating Teams – Half of all tickets for the CFP National Championship Game are allocated to the two universities, with the tickets sold directly through the institutions themselves. Unless you have a major connection at the school or know somebody in the higher-ups of the ticketing offices for the school, your opportunity to secure a ticket to the game will be extremely difficult. Bidding – Another opportunity to secure cheaper tickets for the College Football Playoff National Championship would be to utilize TickPick’s bidding platform, which allows a user to bid on tickets in certain sections or seat ratings at their price. If a seller with tickets for the game elects to accept the bid, the bidder’s card is charged and the order processes like any other transaction at the bidder’s price. For more information on how to take advantage of the bidding option, view our bidding tutorial . If you weren’t able to secure tickets through any presales, general sales, or the aforementioned methods for the College Football Playoffs, don’t worry, you’re not alone. Tickets can still be purchased from secondary marketplaces, although the prices will not be at face value. With the huge fanbases of the the many teams still vying for a birth in the CFP, market prices are anticipated to be on the higher side, but that doesn’t mean that good deals can’t be had – if you know where to look. With high prices come high service fees with many marketplaces, but not TickPick. 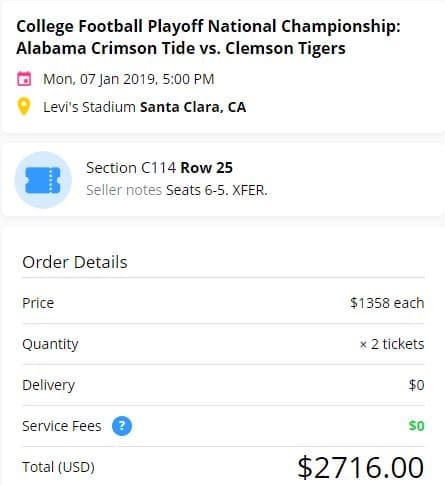 Here at TickPick we have no service fees, making us your source for the Cheapest College Football Championship tickets on the secondary market. Given the high face values and extreme resale value of this annual event, prices can get out of hand quickly when you factor in the fees that every other marketplace aside from TickPick will charge you on top of the listed price. 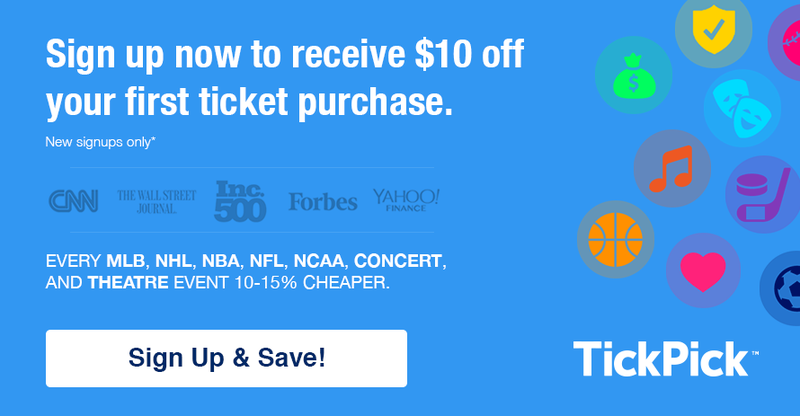 When Is the Time to Buy College Football Playoff Championship Game Tickets? The CFP Championship is one of the biggest events in sports every single year, and is even more important to many football fans than is the Super Bowl. We at TickPick field numerous calls and emails from fans interested in securing tickets to this game, and we’ve essentially handled it as we would for the Super Bowl given the extreme value and high demand for these tickets that only increases as the matchups shake out. What we’d tell an interested buyer is that if you’re comfortable with prices where they’re at, we’d suggest buying now rather than risking the prices continuing to go up as the championship matchup is set. Why Should I Buy Tickets for the CFP Championship Game Through TickPick? In short, securing your tickets through TickPick is the way to save money because of our no fee pricing structure that makes a much bigger difference on the total price of tickets as prices for an event like this get higher. TickPick has had an extreme increase in sales for major events like the Super Bowl in recent years because fans out there tend to do plenty of research when they’re willing to commit thousands of dollars per ticket. When a fan is looking to purchase a ticket that is listed on both StubHub and TickPick, for example, the price will ultimately be higher (usually by hundreds of dollars) once the fees are applied on other sites like StubHub who tack on the fees at the end. Refer to an example below for premium lower level seats in section 114, row 25 for the game that are listed on both TickPick and StubHub. Notice the difference with the above graphic’s initial listed price with what you’ll actually pay on StubHub for these great seats to the game in the graphic below. 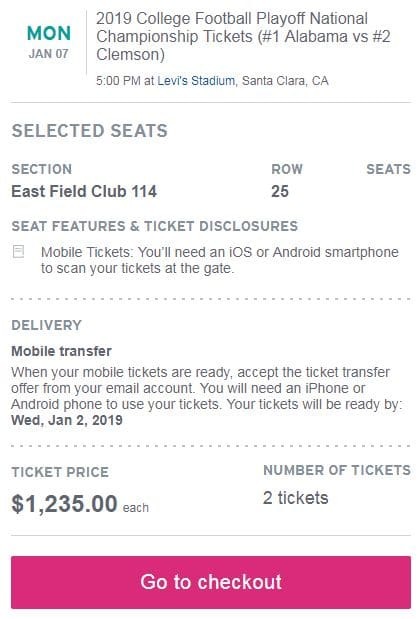 Initially, these tickets were showing at $1,235 per ticket. Great deal, right? You would think so, until you go to checkout on the order. StubHub tacks on fees of an astronomical 21+% to the original price that would amount to the buyer paying an additional $332.18 PER TICKET (without factoring in the $2.50 “fulfillment fee” per ticket) on top of the misleading price that the buyer would see before checking out. Now, compare the StubHub prices above with that of the prices on TickPick below, which initially show for $3221 per ticket with all-in pricing (which is unchanged from the listed price all the way through checkout and never adds or includes fees) with that of the graphic above for the exact same tickets on StubHub. The price on StubHub jumps from initially showing at $1,235 per ticket (presumably $2,470 for the pair) on StubHub to $3,139 for the pair, or an increase of $669 that is just accounting for fees that other ticket sites like StubHub are charging the buyer. See the graphic above for the total price (which never includes fees and will always show as lower once the fees on other sites are applied), which amounts to a difference of $603.86 that you’d save by purchasing the EXACT SAME tickets from the same seller on TickPick over StubHub. This savings only extrapolates as the prices per ticket increase. Do the research before making your decision in order to save big. Besides all of these reasons, TickPick is the only marketplace that allows for a payment plan to purchase expensive tickets that may normally break the bank for some fans. For more information on how to pay in installments, read more about it here in our blog about our partner Affirm. When Will I Receive My Tickets for the College Football Playoff National Championship Game? With major events like this, tickets often times aren’t allocated by the teams until the week of the event. The reason for that is that the matchups aren’t predetermined, so once they become apparent (in this case, on 12/29, a mere nine days prior to the title game) the schools are allocated tickets by the venue and NCAA that go to donors, alumni, current students, etc. These tickets may very well hit the resale market well ahead of when they’re actually received by the brokers who are able to list them for sale. Given that the event takes place at the newer Levi’s Stadium, where the vast majority of tickets are mobile entry only for events like San Francisco 49ers games, most buyer should expect to receive their tickets electronically as mobile QR codes that have been implemented by many venues around the country to severely reduce the risk of fraud. Please keep in mind that mobile tickets may not be available until 24-48 hours prior to game time, but as soon as the seller is granted access to them from the venue, they will then take the time to manually transfer them to the buyer’s account to be claimed on their mobile phones. As always, TickPick provides our buyers with a BuyerTrust Guarantee on all tickets, assuring any buyers that tickets purchased through us will be secure and 100% valid for entry. Sellers stand to lose a lot of money should their tickets ever not work for any event, let alone one with high values on tickets like this, so they have every reason to ensure there will not be any issues. Furthermore, many tickets for this event will be via the aforementioned mobile entry, which is a system implemented by the venue in order to prevent fraud (the mobile QR codes aren’t released until a few days prior to the game at most and cannot be duplicated). The rest of these tickets are hard stock that are issued directly from the venue and have systems in place to verify and ensure that they cannot be counterfeited.